Does Thai Amnesty Bill Herald Thaksin’s Return? Amid debate over a proposed amnesty bill, tensions rise and rumors of a coup grip Thailand. Bangkok is on edge this week as parliament debates a proposed bill that would provide amnesty for political offenders involved in bouts of unrest that have occurred in the country since the ouster of former Prime Minister Thaksin Shinawatra on September 19, 2006. The proppsed bill is intended to promote political reconciliation following Thaksin’s ouster in 2006. Headlines have splashed across the front pages of local newspapers this week surrounding escalating tensions and rumors of a potential clash. On Wednesday some 2,000 opposition Democratic supporters convened outside the gates of the parliament building to protest the proposed legislation. A police cordon surrounded the building, which protesters did not attempt to breach despite earlier threats. Video shot this week in Bangkok, which reveals some of this tension playing out, can be seen here and here. This time, it’s not only Thaksin opponents who are clashing with the government. Along with those who align with the opposition party, human rights activists also oppose the bill, which proposed by Worachai Hema, a lawyer for current Prime Minister Yingluck Shinawatra and Thaksin’s sister. The bill was looked at for the first time late on Wednesday and is being pored over by a 35-member committee. Those from the opposition fear that the legislation could be used as a precedent to create a loophole for Thaksin to return to Thailand. Activists, however, fear it would pardon those convicted of human rights abuses since the 2006 coup, including former Prime Minister Abhisit Vejjajiva, who faces charges of murder for authorizing the use of live ammunition against protesters in 2010. “The ruling party’s amnesty bill lets both soldiers and militants responsible for deaths during the 2010 upheaval off the hook,” said Brad Adams, Asia director of Human Rights Watch. Thaksin, a former telecommunications mogul, gained a huge following among Thailand’s poor, which led him to two victories at the polls prior to his ouster. Although he enjoyed significant populist support, he never gained the trust of the royalist establishment, nor its loyal military. These forces saw him as iron-fisted and corrupt. In 2008, the exiled leader was sentenced to two years in prison in absentia on charges of conflict of interest. If he returns to Thailand, he is obligated to serve the time. In 2008 Thaksin opponents – the “yellow shirts” – occupied the PM’s office for three months as well as Bangkok’s two airports for a week. In 2010, 90 people were killed and 2,000 injured when Thaksin supporters, or the “red shirts”, occupied downtown Bangkok. 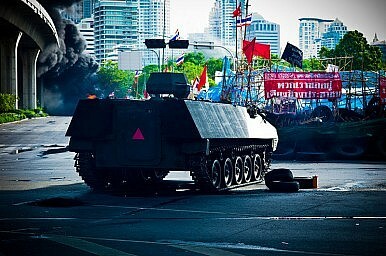 The city was in lockdown until the military flushed out Thaksin supporters. Given this history, the rising tensions have understandably put people on edge, especially in the capital. So far, at least, the protests have remained peaceful. At the request of their leaders, protesters reportedly dispersed on Wednesday, rather than clash with police outside parliament. Around 4,800 police have been mobilized in Bangkok for this week’s protests, along with the invoking of an internal security act that includes a provision to ban gatherings near parliament. The act remains in place until August 10, and also allows the government to impose curfews, close roads and ban the use of electronic devices in certain areas. Nonetheless, these gatherings have prompted rumors of another potential coup, which the army has denied and the government swiftly stamped out. According to The Guardian, four Facebook users are being investigated for allegedly spreading false information. They could spend up to five years in jail and face heavy fines if convicted. Alongside the prospect that violence could break out, there are also financial worries. Should a clash ensue, market analysts speculate that financial fallout could be significant. A number of foreign investors have sold stocks in recent trading sessions. On Wednesday, Bloomberg reported that Thai stocks had the steepest drop on any bourse in Asia. Until these agendas come to light, the nation will remain on edge.